Microsoft reports that “Windows 7 is almost immune to Win32/Alureon rootkit, and it has proven a real nightmare to users running older versions of Windows particularly XP SP3 customers have been hit extremely hard by Alureon, a rootkit that failed to play nice with a Windows kernel update and ended up rendering unbootable infected PCs earlier this year. Microsoft’s Malicious Software Removal Tool cleaned no less than 356,959 Windows computers infected with Alureon, with Redmond company pointing out that the statistics are associated exclusively with May release of MSRT. 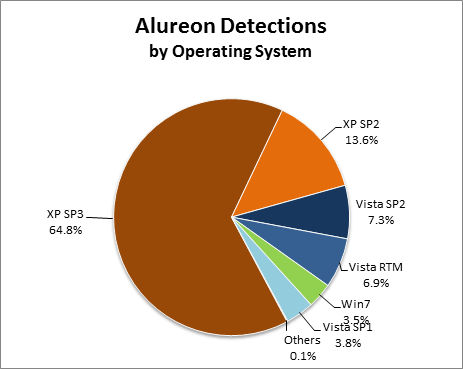 Out of all machines cleaned MSRT only 3.5% were running Windows 7.” In this context, Alureon comes to prove just how unsafe are older Windows, as XP SP3 PCs account for bulk of infections, no less than 64.8%. Runner-up is XP SP2 with 13.6%, Vista SP2 with 7.3%, Vista RTM with 6.9% and Vista SP2 with 3.8%. Combined, machines running XP SP2 and SP3 make up 78.4% of all Windows computers compromised by rootkit. At this point in time, Virus:Win32/Alureon.H is the most prevalent flavor of the browser, having been cleaned from 155,394 PCs, Vishal Kapoor and Joe Johnson, MMPTC noted.